Ryan Alexander Borden Smyth (born February 21, 1976) is a Canadian former professional ice hockey winger who played most of his career for the Edmonton Oilers of the National Hockey League (NHL). He was especially known for playing in the style of a power forward. Smyth announced his retirement on April 11, 2014, after 19 seasons in the NHL. He is currently one of the owners of the AJHL Spruce Grove Saints. During his junior career, Ryan Smyth spent three years with the Moose Jaw Warriors of the Western Hockey League (WHL), scoring 105 points during the 1993–94 season. Smyth was then drafted 6th overall in the 1994 NHL Entry Draft by the Edmonton Oilers. That year he played only three games for the Oilers, as he stayed for the majority of the year in Moose Jaw. He spent 12 seasons with Edmonton before being traded to the New York Islanders in 2007 due to failed contract negotiations. Becoming an unrestricted free agent in the subsequent off-season, he signed a five-year contract with the Colorado Avalanche. After two seasons with the team, he was traded to the Los Angeles Kings in July 2009. On June 26, 2011, he was re-acquired by the Edmonton Oilers for Colin Fraser and a seventh round pick in 2012. Smyth has represented Canada in international competition on numerous occasions. He has won gold medals at the 1995 World Junior Championship, 2002 Winter Olympics, 2003 and 2004 World Championships, and 2004 World Cup. Having served as captain of Canada's World Championship team for a team record six years (2001–05 and 2010), he has earned the nickname "Captain Canada." Smyth is also Canada's all-time leader in games played at the tournament. He played a record 90 games for Hockey Canada while becoming the only player in hockey history to win gold in all of Olympics, World Cup, World Championships (2x), World Juniors, and Spengler Cup. Smyth played in the junior ranks with the Moose Jaw Warriors of the Western Hockey League (WHL). Beginning in 1991–92, he debuted in two games with the team, recording no points. The following season, he notched 19 goals and 33 points over 64 games as a rookie. In 1993–94, he improved to 50 goals and 105 points over 72 games, becoming a top NHL prospect. During the subsequent off-season, he was selected sixth overall by the Edmonton Oilers in the 1994 NHL Entry Draft. Some Oilers' scouts wanted to draft Ethan Moreau (future Oilers captain), in part because he was a linemate of the Oilers' fourth overall selection, Jason Bonsignore (who only ended up playing 79 NHL games, 21 of those with the Oilers). Sather, however, went with the opinion of scout Lorne Davis and selected Smyth instead. Following his selection, Smyth returned to the WHL for one more season with Moose Jaw, recording 41 goals and 86 points over 50 games in 1994–95. He helped the Warriors qualify for the playoffs for the first time in his tenure with the team and added 15 points over 10 post-season games. Smyth had his number 28 retired by the Moose Jaw Warriors in 2015. During his final junior season, Smyth was briefly called up to the NHL by the Oilers. He made his debut on January 22, 1995, in an away game against the Los Angeles Kings. Playing in three games total, he did not record any points. The following season, he tallied his first goal, on November 24, 1995, against Trevor Kidd of the Calgary Flames while on the power play. He went on to record two goals and 11 points over 48 games as a rookie, while also spending time in the American Hockey League (AHL) with the Oilers' minor league affiliate, the Cape Breton Oilers. He recorded 11 points over 9 AHL games in 1995–96. Smyth spent the entire 1996–97 season with the Oilers and improved to 39 goals (a career-high) and 61 points over 82 games. At the beginning of the season, on October 8, 1996, he recorded his first of five career hat tricks. With 20 power play goals, he tied Wayne Gretzky's team record, set in 1983–84. In the 1997 playoffs, he added 10 points in 12 games. Despite a strong second NHL season, he struggled in the next two campaigns with 33- and 31-point efforts. In 1999–2000, he returned to form with a 28-goal, 54-point year. The following season, he recorded a career-high 39 assists and 70 points, ranking second in team scoring to team captain and first-line centre Doug Weight. As Weight was traded in the off-season to the St. Louis Blues, Smyth took on a larger role as offensive leader on the team. For the remainder of his tenure with the Oilers, he remained in the 50–60 point range. During the 2001–02 season, he ranked third in team scoring with 15 goals and 50 points to Mike Comrie and Anson Carter's 60 points, despite playing in 21 games less than them due to injury. The following season, he appeared in 66 games and increased his offensive totals to 27 goals and 61 points. It marked the first time in his career that he led the Oilers in scoring, edging Todd Marchant by one point. During the off-season, Smyth filed for salary arbitration after initially failing to come to terms on a new contract with the Oilers. On August 14, 2003, both sides avoided arbitration by signing a two-year contract. Playing a full 82 games in 2003–04, Smyth tallied 59 points (23 goals and 36 assists) to lead the Oilers in scoring for the second straight year. Due to the 2004–05 NHL lockout, Smyth spent the season inactive. As NHL play resumed the next year, he approached career-high totals with 36 goals and 66 points. With several young players emerging on the team's roster, Smyth ranked fourth in team scoring, behind Aleš Hemský, Shawn Horcoff and Jarret Stoll. His 19 power play goals came within one of the team record he previously set in his second year with the Oilers. Although Edmonton entered the 2006 playoffs as the eighth and final seed in the Western Conference, Smyth helped the team on a run to the Stanley Cup Finals with 16 points in 24 post-season games. During the second round against the San Jose Sharks, he was hit in the mouth with a puck as a result of a clearing attempt from defensive teammate Chris Pronger. After losing three teeth and needing stitches, Smyth returned in the third period and went on to set up Shawn Horcoff's game-winning goal in triple-overtime. The win reduced San Jose's series lead to 2–1, helping the Oilers eventually advance to the Conference Finals in six games. After eliminating the Mighty Ducks of Anaheim in the third round, the Oilers were ultimately defeated in seven games by the Carolina Hurricanes in the Finals. Early the following season, during a game against the San Jose Sharks on October 12, 2006, Smyth broke an Oilers record for fastest three goals scored in one contest. With the Sharks leading 4–2 in the third period, he recorded a hat trick with two goals on the power play and one more on a 5-on-5  in a span of two minutes and one second, breaking the previous team record set by Wayne Gretzky on February 18, 1981, by 17 seconds. It was Smyth's fifth career hat trick as Edmonton went on to win the game 6–4. In the final year of his contract, Smyth was enjoying one of the most productive seasons of his career. As a result, he was chosen to his first NHL All-Star Game in 2007. With the Oilers unable to extend his contract prior to the NHL trade deadline, Smyth was dealt away to the New York Islanders in exchange for prospects Robert Nilsson and Ryan O'Marra, as well as a first round selection in the 2007 NHL Entry Draft. It was reported that Smyth was asking for a long-term deal worth at least $5 million a season to remain in Edmonton. The move was made to ensure the team did not lose Smyth for nothing, as he became an unrestricted free agent in the off-season. At the time of the trade, he was scoring at a point-per-game pace with 31 goals and 22 assists over 53 games. Despite playing the remainder of the season with the Islanders, he finished tied for the Oilers lead in point-scoring that year; Petr Sýkora had 53 points in a full 82 games. Prior to boarding a flight for New York with his family, Smyth tearfully addressed the media at Edmonton International Airport, thanking the Oilers for his time with the organization and expressing regret for having to be traded. He stated he was going to win the Stanley Cup with the Islanders and bring it to Edmonton. Leaving the Oilers after 12 seasons, he ranked seventh on the team's all-time list for points scored with 549 over 770 games. Smyth debuted with the Islanders on March 1, 2007, during a game against the St. Louis Blues. He notched his first point as an Islander with an assist on Mike Sillinger's first period power play goal; New York lost the game 3–2 in overtime. Two days later, he recorded his first goal as an Islander in a 6–2 win against the Washington Capitals. Playing in 18 games with the Islanders to close out the 2006–07 season, Smyth posted 15 points (5 goals and 10 assists). Combined with his stats from Edmonton, he finished with 36 goals and 68 points, the second-highest totals of his career. Smyth's efforts helped the Islanders beat out the Toronto Maple Leafs and Montreal Canadiens for the eighth and final seed in the Eastern Conference for the 2007 playoffs. Playing the first-seeded Buffalo Sabres in the opening round, the Islanders were defeated in five games. Smyth recorded one goal and three assists during the series. Becoming an unrestricted free agent on July 1, 2007, Smyth signed a five-year, $31.2 million contract with the Colorado Avalanche. After debuting with the Avalanche on October 3, 2007, in a 4–3 win against the Dallas Stars, he scored his first goal with his new team four days later. Beating goaltender Evgeni Nabokov short handed during the third period, he helped Colorado to a 6–2 win. Playing on the first line, Smyth found early chemistry with centre and team captain Joe Sakic. The duo was interrupted, however, as both players were sidelined with injuries for large portions of the season – Smyth's included neck, ankle and head ailments. Limited to 55 games, he recorded 14 goals and 37 points, the lowest totals of his career since the 1998–99 season. During the 2008 playoffs, Smyth helped Colorado advance past the Minnesota Wild in the first round. They were, however, swept the following round by the Detroit Red Wings, who went on to win the Stanley Cup that year. Smyth missed the last two games of the playoffs with a foot injury, finishing with two goals and five points over eight games. Smyth bounced back from an injury-filled first year with the Avalanche by remaining healthy for the majority of the 2008–09 season. 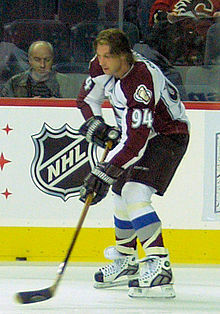 During the campaign, Ryan Smyth and right winger Milan Hejduk scored their respective 300th career goals on January 18, 2009, against the Calgary Flames in a 6–2 victory at the Pepsi Center. He went on to record 26 goals and 33 assists for 59 points over 77 games, before fracturing his right hand on April 1, 2009, in a 3–0 home loss against the Phoenix Coyotes, ending his season five games early. He tied for the team lead in point-scoring with Hejduk, who played in five more games than Smyth. Dealing with long-term injuries to both Paul Stastny and captain Joe Sakic, the Avalanche struggled as a team and finished last in the Western Conference. With the Avalanche in the midst of a rebuilding process, Smyth was traded to the Los Angeles Kings on July 3, 2009, in exchange for Kyle Quincey, Tom Preissing and a fifth round selection in the 2010 NHL Entry Draft. During his Kings debut on October 3, 2009, he assisted on the team's first goal of the season by Anže Kopitar. The Kings, however, lost the game 6–3 to the Phoenix Coyotes. His first goal with the Kings came five days later, scoring against Minnesota Wild goaltender Josh Harding in a 6–3 win. Playing regularly on a line with Jarret Stoll and Dustin Brown, he recorded 22 goals and 53 points over 67 games, ranking fourth in team scoring. Joining a team on a markedly different trajectory than Colorado, the Kings were an improving club. Smyth's efforts helped them qualify for the playoffs for the first time since eight years. Playing the third-seeded Vancouver Canucks in the first round, they were defeated in six games. A month into the 2010–11 season, Smyth played his 1,000th career NHL game on November 6, 2010. His teammates acknowledged the accomplishment by wearing mullet wigs during their morning skate, alluding to Smyth's distinctive hair style. The Kings won the game 4–1 over the Nashville Predators, with Smyth scoring a goal in the second period. Playing in a full 82 games, Smyth finished the season with 23 goals and 47 points. The Kings qualified for the playoffs with the seventh seed and were eliminated in the first round by the San Jose Sharks. During the off-season, it was reported that Smyth had informed Kings management he would prefer to play the last year of his contract with the Oilers. On June 24, 2011, the day of the 2011 NHL Entry Draft, it was reported that the Edmonton Oilers and the Los Angeles Kings had come to an agreement that Smyth would go to Edmonton in return for Gilbert Brulé and a fourth round pick in the 2011 NHL Entry Draft. Upon salary cap and injury concerns, the trade never went through due to the Kings' plan to buy-out Brulé's contract; however, the NHL prohibits team from buying out injured players. Smyth wanted to leave the Kings and return to the Oilers, as he wanted to end his career where he started it. On June 26, 2011, the Kings officially traded Smyth back to Edmonton for Colin Fraser and a seventh round draft pick in the 2012 NHL Entry Draft. 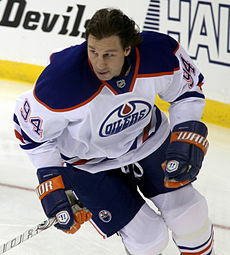 In 2011–12, his first season back with the Oilers, Smyth was the only Oiler to play all 82 games, and was fifth in scoring with 46 points. On February 27, 2012, he recorded his 800th career point, an assist, against the Winnipeg Jets. On January 26, 2014, Smyth tied Wayne Gretzky for number two on the Oilers all-time power play goal-scoring list in a 5–1 win over the Nashville Predators. On March 6, he overtook Gretzky and tied Glenn Anderson for the most power-play goals in franchise history with 126. With the Oilers out of playoff position towards the conclusion of the 2013–14 season, on April 11, Smyth announced his retirement after 19 seasons from the National Hockey League aged 38. He served as the team captain in his final game and also received the game's first star honours. 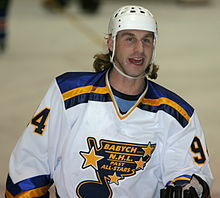 Following his retirement from NHL play, Ryan Smyth played for in the Alberta senior AAA men's hockey league. On March 11th 2017 in game one of the league finals, Smyth was struck with a blindside hit after scoring a goal by a minor league goon, Kyle Sheen. Smyth stayed down for several minutes and was diagnosed with a concussion. Sheen received no penalty on the play but was suspended 16 games by the league following a video review. Smyth debuted with Hockey Canada with the country's under-20 team at the 1995 World Junior Championships in Red Deer, Alberta. He recorded two goals and seven points as Canada went undefeated in seven games to win the gold medal. Four years later, Smyth was chosen to the Canada's men's team for the 1999 IIHF World Championship in Norway. As a result of the Oilers' short playoff seasons (the team made the second round twice and Finals once in his 12-year tenure), Smyth was a mainstay on Canada's World Championship roster (the international tournament conflicted with the NHL's playoff schedule). The 1999 tournament marked the first of seven consecutive appearances for Smyth. He recorded two assists over nine games as Canada finished in fourth place, losing the bronze medal game to Sweden. The following year in Russia, Smyth improved to an international career-high three goals and nine points over nine games. Canada finished fourth for the second consecutive year as they lost the bronze medal game to Finland. In preparation for the 2001 IIHF World Championship in Germany, Smyth was named team captain for Canada; it marked the first of five years he served in that role, earning him the nickname "Captain Canada." Smyth recorded two goals and five points over seven games, but Canada faced an early exit as they were eliminated by the United States in the quarter-final. In December 2001, Smyth was selected to Canada's team for the 2002 Winter Olympics in Salt Lake City, Utah. It marked the first time he was selected to a national team when all NHL players were available (the league temporarily suspended play during the 2001–02 season to allow their players to participate). Smyth contributed one assist in six games, helping Canada win their first Olympic gold medal in ice hockey since 1952. It was also Smyth's first gold medal at the men's level. Later that year, he made his fourth consecutive appearance at the World Championship in Sweden. Canada was once again eliminated in the quarter-final, this time to Slovakia. Smyth had four goals and no assists over seven games. After four years without a medal in World Championship competition, Smyth captained Canada to gold at the 2003 IIHF World Championship in Finland. He recorded two goals and four points over nine games, en route to a 3–2 win over Sweden in the final. Canada defended their gold medal the following year in the Czech Republic. In a rematch of the previous year's final, Canada beat Sweden 5–3. In nine tournament games, Smyth contributed two goals and four points. In September 2004, the NHL and NHL Players Association held the first World Cup of Hockey in eight years. Held outside of the NHL schedule (although league play was suspended for the 2004–05 season due to a lockout), all players were eligible to participate. Smyth was named to the national team and contributed three goals and an assist over six games. Canada won the World Cup title with a win over Finland in the final. The following year, all NHL players were again available for international competition at the 2005 IIHF World Championship in Austria, due to the ongoing lockout. It marked the first time that this was the case in tournament history. Smyth retained his captaincy and helped Canada to the gold medal game for the third straight year. Facing the Czech Republic, they were shut out 3–0, earning the silver medal. In December 2005, he was named to Canada's Olympic team for the 2006 Winter Olympics in Turin, Italy. Canada failed to defend their gold medal from 2002, however, and were eliminated in the quarterfinal by Russia. Smyth was held to one assist in six games. He was also selected for the 2010 Winter Olympics summer roster for Team Canada in August 2009, but did not make the final roster cut. The 2010 IIHF World Championship tournament in Germany would mark Smyth's last appearance for Canada, where he was named team captain for the sixth time, a Canadian record at the tournament. Early on in the tournament, he suffered an ankle injury during practice and was kept from the remainder of the competition. Canada lost the quarter-final to Russia that year. In 2012, he won the Spengler Cup playing for Canada, again serving as the team's captain. Smyth played in the style of a power forward, depending largely on his size and strength to contribute offensively. By positioning himself in front of the net, he earned most of his goals by tipping pucks in past the goaltender or scoring on rebounds. He did not possess particularly good shooting, stickhandling or skating skills. He had been known to use a two-piece stick (composite shaft with wooden blade) with a flat blade, both of which were trends which largely went out of date during or before Smyth's career. As a result, his success was predicated less on skill, but more on force and determination. When the Oilers drafted him out of junior, it was said that General Manager Glen Sather was looking for someone with "lots of guts. "[by whom?] Smyth was also known as a leader, having served as captain for Canada's World Championship teams on six occasions, as well as an alternate captain on all of the teams he played with in the NHL. Smyth and his wife Stacey have three daughters, Isabella May (born July 9, 2003), Elizabeth Ann (born April 4, 2005) and Gabrielle Grace (born June 24, 2013) and one son, Alexander Kenneth (born June 26, 2008). His wife owns a clothing store called Four. His older brother, Kevin played 58 games in the NHL for the Hartford Whalers. Smyth was made a member of the Order of Hockey in Canada in 2018. ^ a b c "Smyth named Canada's captain for 6th time". Canadian Broadcasting Corporation. Canadian Press. 2010-05-07. Retrieved 2011-06-21. ^ "Moose Jaw Warriors retire Ryan Smyth's number". Global News. Retrieved 2016-01-18. ^ a b Spector, Mark (2010-11-04). "1,000 reasons". Rogers Sportsnet. Retrieved 2011-06-21. ^ a b "Regular Season – Edmonton Oilers – All Skaters – Single Season Leaders for Team – Career Power Play Goals". National Hockey League. Retrieved 2011-06-21. ^ "2000–2001 – Regular Season – Edmonton Oilers – All Skaters – Summary – Total Points". National Hockey League. Retrieved 2011-06-21. ^ "2002–2003 – Regular Season – Edmonton Oilers – All Skaters – Summary – Total Points". National Hockey League. Retrieved 2011-06-21. ^ "2003–2004 – Regular Season – Edmonton Oilers – All Skaters – Summary – Total Points". National Hockey League. Retrieved 2011-06-21. ^ "2005–2006 – Regular Season – Edmonton Oilers – All Skaters – Summary – Total Points". National Hockey League. Retrieved 2011-06-21. ^ "Ryan Smyth gives Oilers a lift". The Vancouver Sun. May 12, 2006. Archived from the original on November 10, 2012. Retrieved June 21, 2011. ^ "Hats off to Ryan Smyth". The Edmonton Journal. October 13, 2006. Archived from the original on November 10, 2012. Retrieved June 21, 2011. ^ a b "Smyth: This is not what my family and I had in store". ESPN. 2007-03-01. Retrieved 2011-06-21. ^ "2006–2007 – Regular Season – Edmonton Oilers – All Skaters – Summary – Total Points". National Hockey League. Retrieved 2011-06-21. ^ "Regular Season – Edmonton Oilers – All Skaters – Career Leaders For Team – Career Points". National Hockey League. Retrieved 2011-06-21. ^ "Blues 3, Islanders 2, OT". New York Islanders. Associated Press. 2007-03-01. Retrieved 2011-06-21. ^ "Islanders 6, Capitals 2". New York Islanders. Associated Press. 2007-03-03. Retrieved 2011-06-21. ^ "2006–2007 Regular Season". National Hockey League. Retrieved 2011-06-21. ^ Dater, Adrian (2007-07-02). "Colorado signs Smyth, Hannan". The Denver Post. Retrieved 2009-04-02. ^ "Stastny's hat trick leads Avs to 4–3 victory". Colorado Avalanche. Associated Press. 2007-10-03. Retrieved 2011-06-21. ^ "Avs earn 6–3 victory over Sharks". Colorado Avalanche. Associated Press. 2007-10-07. Retrieved 2011-06-21. ^ Eliot, Darren (2007-10-29). "Peak production". Sports Illustrated. Retrieved 2011-06-21. ^ a b "Ryan Smyth". The Sports Network. Retrieved 2011-06-21. ^ Dater, Adrian (2009-01-18). "Smyth, Hejduk score perfect game: hit 300". Denver Post. Retrieved 2009-04-02. ^ "Avs' Smyth breaks hand, done for season". cbc.ca. 2009-04-02. Retrieved 2018-01-24. ^ "2008–2009 Regular Season – Colorado Avalanche – All Skaters – Summary – Total Points". National Hockey League. Retrieved 2011-06-21. ^ "2008–2009 Regular Season". National Hockey League. Retrieved 2011-06-21. ^ Hammond, Rich (2009-10-03). "Kings fall to Phoenix 6–3 in season opener". Los Angeles Kings. Retrieved 2011-06-21. ^ Hammond, Rich (2009-10-08). "First line shines as Kings beat Wild 6–3". Los Angeles Kings. Retrieved 2011-06-21. ^ "2009–2010 – Regular Season – Los Angeles Kings – All Skaters – Summary – Total Points". National Hockey League. Retrieved 2011-06-21. ^ Hammond, Rich (November 6, 2010). "Kings beat Predators 4–1". Los Angeles Kings. Archived from the original on March 24, 2011. Retrieved June 21, 2011. ^ McKenzie, Bob (2011-06-20). "Ryan Smyth tells Kings he'd prefer to rejoin Oilers". The Sports Network. Retrieved 2011-06-21. ^ "NHL draft is done but Ryan Smyth trade isn't". Los Angeles Times. June 25, 2011. Retrieved June 26, 2011. ^ "Smyth deal to Oilers dies, has to be reworked". Calgary Herald. Retrieved June 26, 2011. ^ "Oilers acquire Smyth from Kings for Fraser, 7th round pick". The Sports Network. Retrieved June 26, 2011. ^ "RECAP: Oilers 3, Islanders 2 (OT)". EdmontonOilers.com. Retrieved March 6, 2014. ^ "Oilers Smyth announces retirement after 19 NHL seasons". The Sports Network. 2014-04-11. Retrieved 2014-04-11. ^ Elliott, Josh (April 13, 2014). "RYAN SMYTH RETIREMENT CEREMONY A CLASSY MOVE BY EDMONTON OILERS". thehockeynews.com. Retrieved September 7, 2018. ^ Barnes, Dan (2017-01-17). "Dan Barnes: Ryan Smyth once again an Oiler, always an Oiler". Edmonton Journal. Retrieved 2018-08-08. ^ "Kevin Smyth Career Stats". hockeydb.com. 2007-03-20. Retrieved 2008-11-10. ^ "Mike Babcock, Danielle Goyette, Ryan Smyth Hockey Canada's 2018 Order of Hockey in Canada Distinguished Honourees". Hockey Canada. 2018-01-23. Retrieved 2018-01-23. Wikimedia Commons has media related to Ryan Smyth.